Dr William Gordon of Carrol, in Sutherland, was the second son of John Gordon of Carrol and a cousin of J Crawford Macleod, a merchant and plantation owner in Guyana. He came out as a doctor to Berbice with high hopes of making money, having been encouraged by James Fraser of Belladrum. He provided his services to Lord Seaforth's plantations [GD46/17/23] but was seriously ill in 1803 [NRAS 2696] and resigned the position in 1804. He was at plantation Geanies in 1806 when Thomas Staunton St Clair visited and joined in an expedition up the Corentyne river. 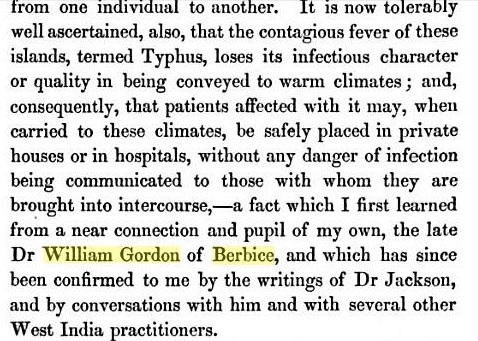 Dr Gordon later reported that '500 persons died of the yellow fever in Berbice between July, 1804, and May, 1805' [Horatio Gates Jameson, A Treatise on Epidemic Cholera (Philadelphia, 1855), p171]. Dr William Gordon, of Berbice, was charged at Bow Street in 1813 with a breach of the peace, in putting in bodily fear Hugh Rose by sending a challenge to him. The "Times" (Aug. 10, p. 3, col. 5) says that Gordon called Rose a coward for slandering his character, when the doctor was 4000 miles off ; and that he was "shrunk from his desert" under the pretext that he intended to attack him [Rose] with a law suit. The letter enclosed a placard calling Rose a lying scoundrel and a base coward, "to which the doctor signed his name and which was threatened to be posed wherever his name is known, unless within two years after the receipt of it he acted the part of a gentleman. The doctor stated that he should deliver the letter with his own hand at the residence of Mr Rose. The letter contained a variety of other violent language and charges against Mr Rose. The defendant after this sent a note to the prosecutor called "Ultimatum," which desired Mr Rose to acknowledge in writing that his statement of the transaction between them was true, and that what he had said of Dr Gordon's character was not correct and ask pardon or suffer the most degrading insults. Mr Kinnaird, the sitting magistrate, after a suitable admonition to Dr Gordon on the heinous nature of his offence, ordered him to find bail and to keep the peace till next term, himself in £500 and two sureties in £250. The estate of Carroll, in Sutherland, was sold to the Earl of Sutherland in 1810. Dr Gordon died in Berbice in January 1817 [Scots Magazine] at which time he owned - unless it is another William Gordon - 118 slaves on plantation Maida, on the east sea coast [Slave Returns].